The Bank of Japan is pulling yet another new monetary policy out of its bag of tricks in a bid to combat deflation, this time it’s “yield-curve control”. This is the latest in a history of unusual monetary policy, such as negative interest rates, that the bank maintains have been effective in improving Japan’s economy. As part of the new policy the central bank will keep its 10-year government bond yield at zero. Usually central banks only control short-term interest rates, but the bank wants to steepen the yield curve, increasing the difference between the yields of short-term bonds (negative in Japan) and long-term bonds. This is designed to free up more money in commercial banks in Japan for investment. In addition to this, the Bank of Japan will continue to buy about 80 trillion yen in Japanese government bonds annually. The question is how effective the new scheme is going to be, particularly because the announced target rate of the 10-year bond is around its current market rate, so the current situation is unlikely to change. However monetary policy hasn’t been able to control deflation and Japan’s national debt remains high. The bank is limited in what policies it can implement. Without a boost to other economic activities, such as an increase in employment, the effects of policies won’t last long. What’s needed is some synergy between the bank’s monetary policy measures and the government’s fiscal policies. This means the government of Japan will have to step up with some consistent stimulus policies to cheer up the economy as soon as possible. The Japanese economy has been stuck for a very long time. 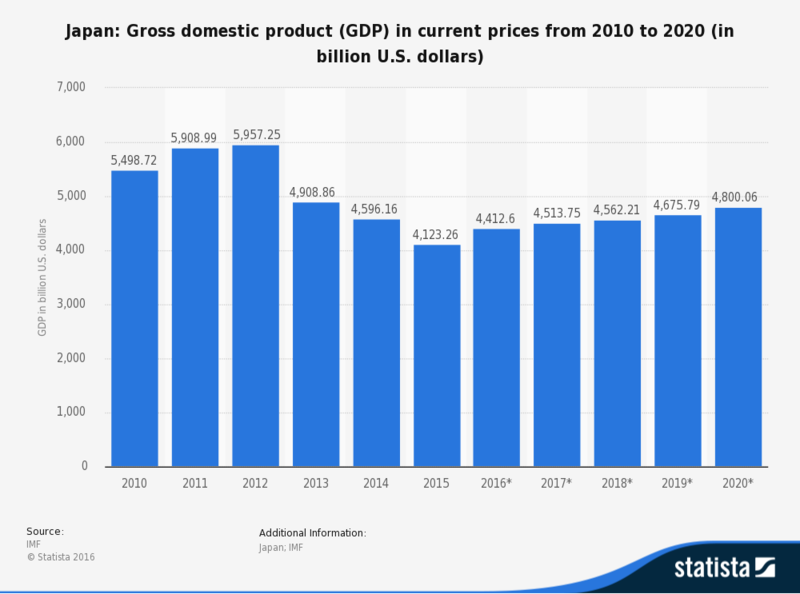 From 1995 to 2005, Japan’s GDP dropped from nearly US$5.3 trillion to US$4.5 trillion, at the same time the country also experienced deflation. When Shinzo Abe was elected as Prime Minister of Japan, he set out a series of economic policies, dubbed “Abenomics” , to try and promote private investment, reviving the national economy. Another aim in Abenomics is to correct excessive yen depreciation, however this hasn’t proved successful yet. After Abe nominated Haruhiko Kuroda as the new governor of the Bank of Japan in 2013, the yen depreciated drastically. In 2011, the exchange rate between US dollar and Japanese yen was almost 76 yen to 1 US dollar, after Kuroda’s nomination, it went above 100 yen to 1 US dollar. The Bank of Japan has been implementing bold expansionary monetary policies since Kuroda’s nomination, thinking that Japan’s economy is in the process of slow recovery. The first tool the bank tried to stimulate economic activity was an extensive bond buying operation. When a central bank buys bonds, it injects money into a country’s financial sector. The expectation is the injected money will flow into the rest of the economy and stimulate production and consumption. This in turn will start to raise price levels, helping the government achieve an inflation target. This worked for a while in Japan. However, recently deflation shows the effect of this monetary policy has faded. According to IMF data , the annual inflation rate in 2013 was 0.36%. In 2014 it showed some promise increasing to 2.75%. But it went back to 0.79% in 2015. Japan’s Bureau of Statistics shows that the consumer price index for Japan, one of the measures of inflation, was 99.6 in July. It went down by 0.2% from the previous month and down by 0.4% over the year. All signs of deflation. There could be many reasons for this sort of deflation, but one of the most serious issues in Japan is enormous national debt. Japan’s gross government debt is 226% of GDP and Japan’s fiscal situation is getting into territory we have never seen. In April 2014 consumption tax was raised from 5% to 8% in a bid to increase government revenues and fight debt. But according to the IMF , the increment of public debt has been decreased but the public debt itself is not decreasing. Huge national debt is a threat to sound economic systems and maintaining the social security system, or public services. Japan needs to reduce national debt as soon as possible. Since January 2016 the Bank of Japan has been charging a negative interest rate on a portion of reserves that commercial banks keep with the bank. This means the central bank charges a fee to the commercial banks, instead of these banks receiving some interest in return for depositing money. The aim is to encourage banks to allocate money to more productive uses for the economy, such as investing in businesses. World Bank data shows that this sort of credit to the private sector has been going up in Japan since 2011 but there hasn’t been a noticeable response in the economy. If a central bank succumbs to government pressure and implements an overly aggressive expansionary monetary policy, it can lead to dysfunction of the whole economy. Japanese law states the importance of the central bank’s independence and neutrality from the government in deciding monetary policy. But the law also states that the Bank of Japan’s basic monetary policy should be consistent with the economic policy of the government. Whether or not this framework will continue to work depends on whether fiscal and monetary policies can work in synergy in the Japanese economy.